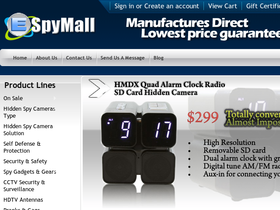 ESpyMall, online at eSpyMall.com, is your destination for security and surveillance equipment. eSpyMall sells hidden spy cameras, HDTV antennas, listening devices, GPS tracking systems, digital audio recorders, pepper spray, stun guns, storage safes, telephone spy equipment, and complete surveillance systems. eSpyMall also offers hidden camera mini-camcorders and video camcorder watches as well as gag gifts including: fake blood capsules, lock picks, invisible ink pens, and professional telephone voice changers. RetailSteal.com has the best eSpyMall coupon codes, eSpyMall discounts, eSpyMall coupons, and eSpyMall promo codes. Shipping and handling rates at eSpyMall depend on the pricing of your purchase and your shipping destination. See website for full details, exclusions may apply. Get 15% off all orders using the coupon code online at eSpyMall.com. Click to shop. Save 10% on camcorders and antennas when shopping with the coupon code online at eSpyMall.com. Click to shop. Receive a 10% discount on cameras and antennaes when you use our coupon code at eSpyMall. Get 5% off all orders using the coupon code online at eSpyMall.com. Click link to save. Use this promotional code for a limited time at eSpyMall to save $50 on your purchase of a Sony digital clock hidden spy camera with built-in DVR. Using the coupon code, save $50 on any order online at eSpyMall.com. Click to save. Save $10 when you order two or more Best Outdoor HD Antennas at eSpy Mall and use the coupon code. Click link to shop. Purchase a car camera with a G force sensor and GPS logger from eSpyMall for the low price of only $199 when you use this coupon code at checkout. Get free shipping on all orders using the coupon code at eSpyMall.com. Click link to save. Receive a free mini camcorder with any online order at eSpy Mall. Click link to shop online.